Ok, I am FINALLY going to start a build thread. Anyone wanting to see current progress though will probably have to wait a little bit as it will take me awhile to tell the story from the beginning and document the progress. Unfortunately, when young, about 1981 I started working on it with no garage, limited tools and experience and no internet to research. 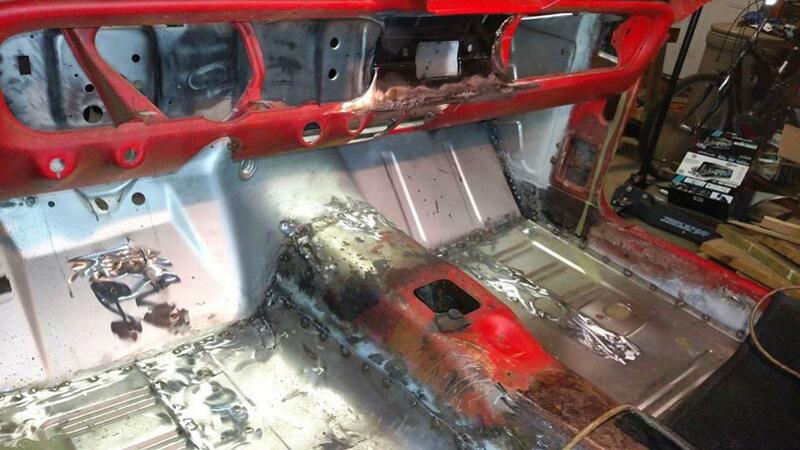 Progress stalled and the car deteriorated some. Divorce, no money, going back to school etc and the car sat. Finally in 1985 or so I took a stab at getting it going, dropping another 289 in it and driving it around some covered in black primer. 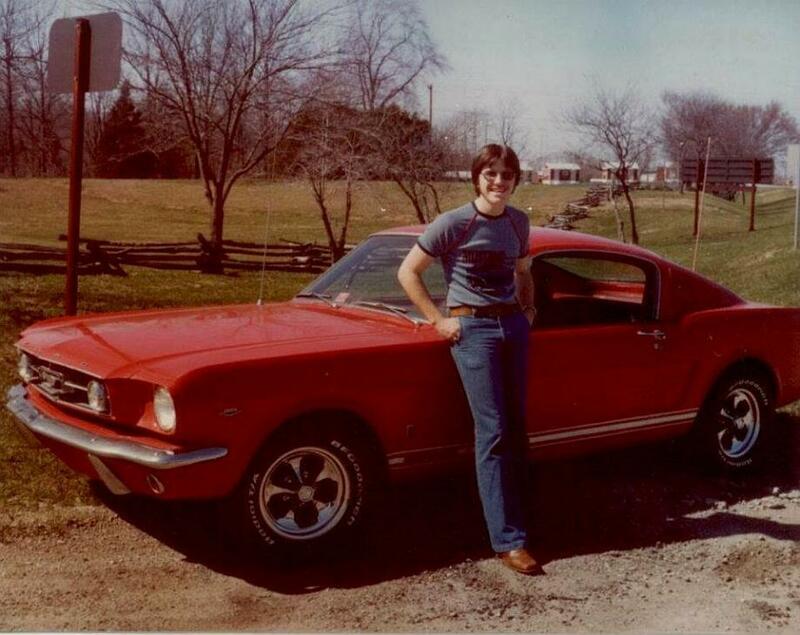 Then I graduated with my degree in electronics and moved to Texas to work in the defense industry and the car sat. It sat for several decades through job changes, a new wife and building a house. My wife asked me why I didn't go to car shows and I told her it was because I might get the bug again. 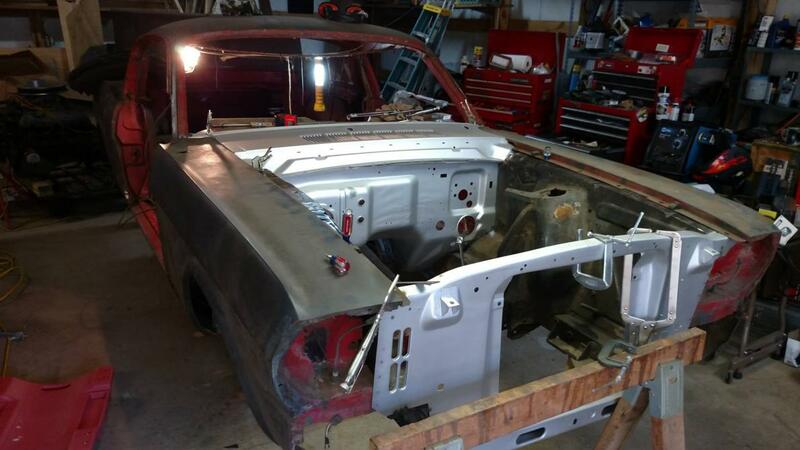 Finally my sister started dating a guy who was finishing up rebuild of a 64 Impala. 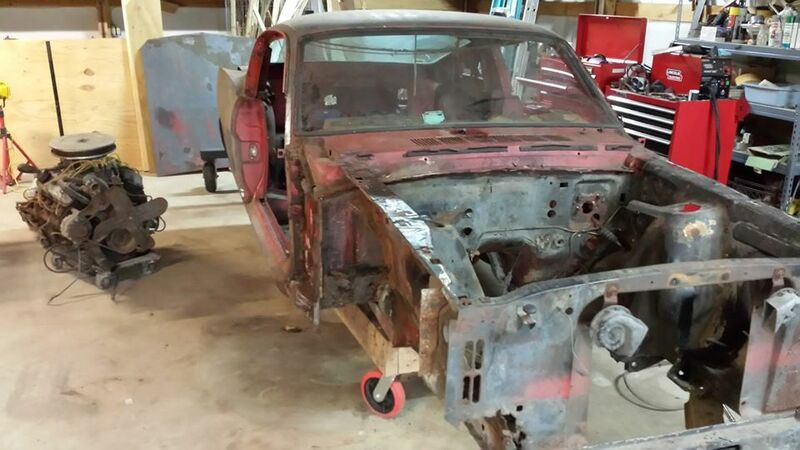 He had done all the work himself and I saw pictures of the rust bucket he had started out with. The bug bit and left an itch that had to be scratched! 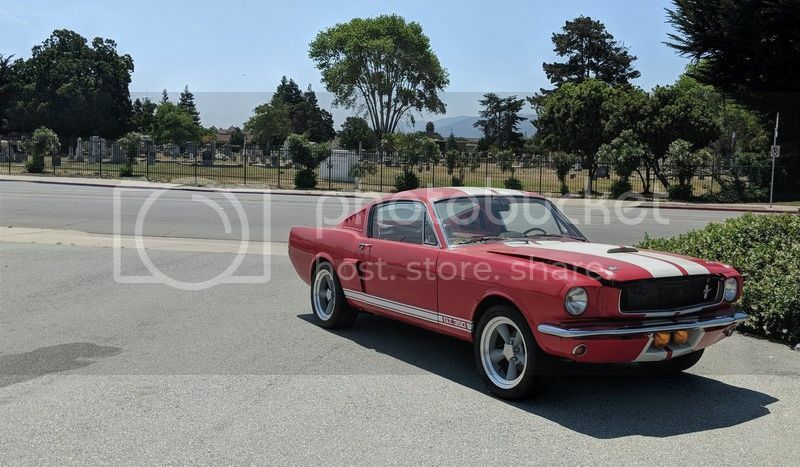 Grabber70Mach, gt350sr, sessayan and 4 others like this. The cars last move was from our old house where it had been sitting in a lean too. Water had leaked in, people had nosed around and left shed doors open etc. and rust had set in. I brought it in and parked it in my new shop building, in the dry at last, where it would sit for the next few years until the bug bit me again. 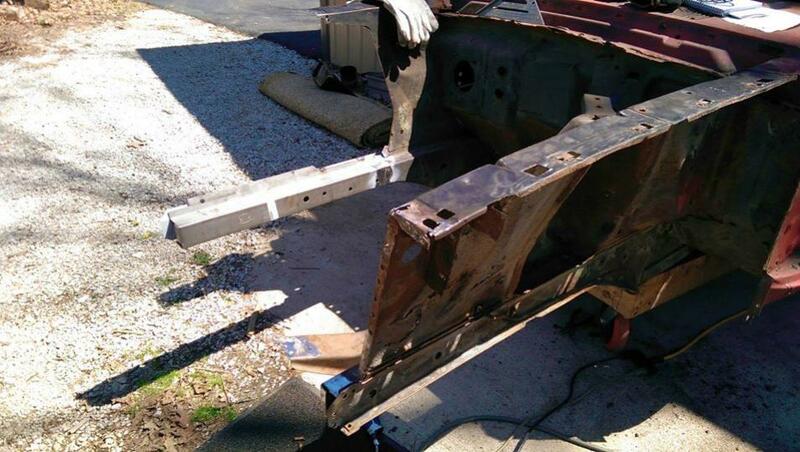 Once I started in, it was obvious just how much the rust had damaged and what a project was ahead of me. It was very discouraging and almost tempting to sell it and move on...but I had too much sentiment in the old car. Grabber70Mach and image98 like this. I spend many days just stripping it down, trying to take pictures and label parts as I removed them. 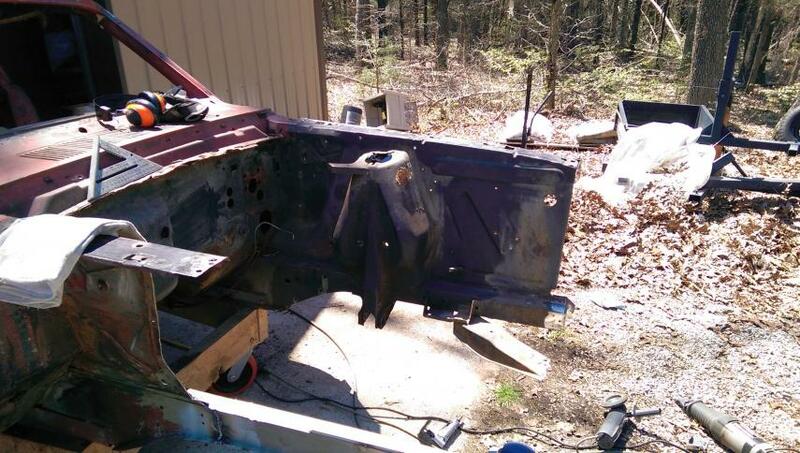 When I finally started actually replacing stuff, my first stab at it was the front end. I had to install driver's side frame rail patch, battery apron and radiator support. First time doing anything like this. 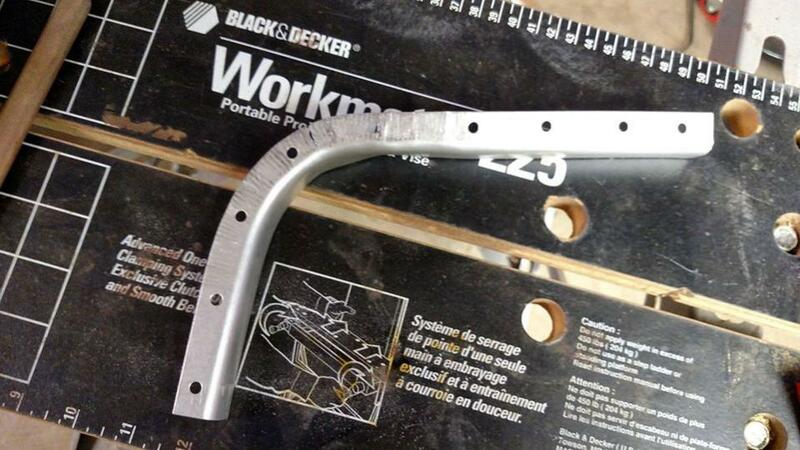 I had done a little stick welding 25-30 years before but I knew this wouldn't cut it. I did some research and bought a little Lincoln MIG, did some practice repairing some farm equipment and jumped in. Next step was to repair the Flintstone grade floor boards. I knew the cowl would require replacement and I wanted the floor to be solid to help avoid any sagging when I cut the cowl assembly out. 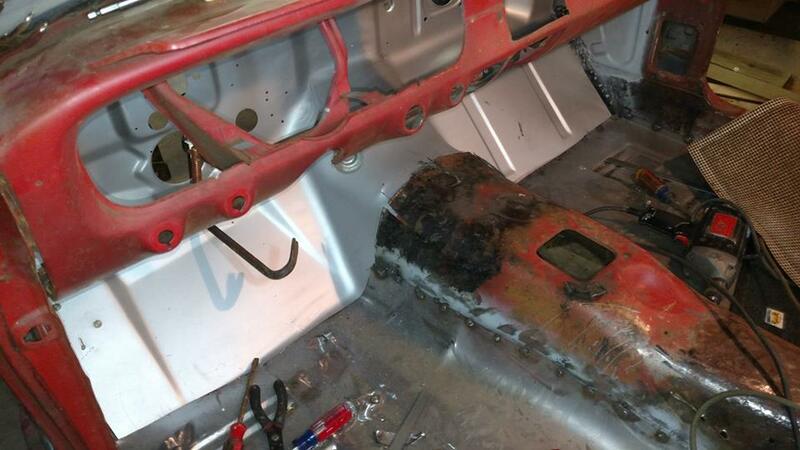 I was very intimidated at the thought of replacing the entire floor pan and decided to go with patches. Looking back at it now, after all the other work I've done, I realize a full floor pan replacement would have been the easiest and wouldn't have been the overwhelming job I thought it would be. I at first installed left and right patches and a floor support and then toe boards that patched the lower part of the firewall. 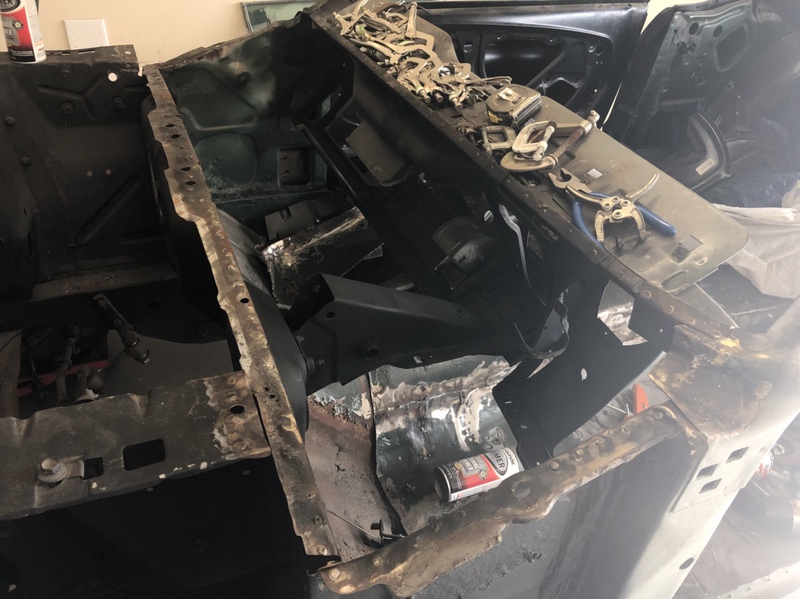 Afterwards, I got to looking closer at the firewall and realized I would be best off to replace it so I had to go back and cut out my newly installed toe boards. 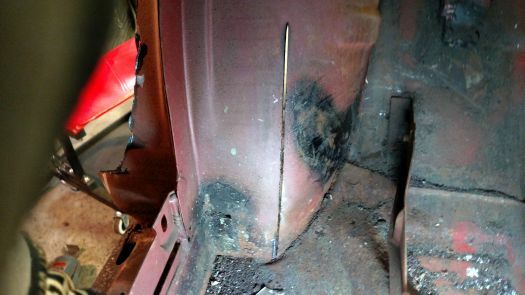 The struggle to remove them at least told me that my welds, while not pretty, were very strong. 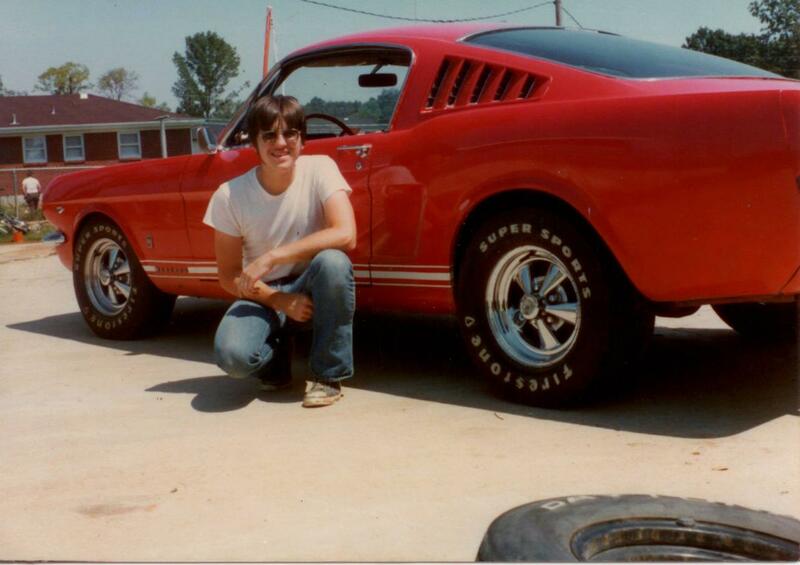 Grabber70Mach, gt350sr and image98 like this. Last edited by Huntingky; 07-26-2018 at 09:17 AM. Well it's about time brother!! 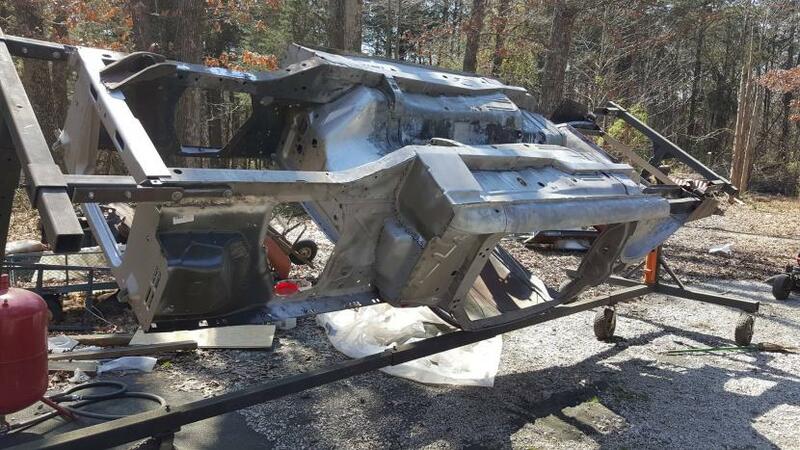 Grabber70Mach, Huntingky, RyanSterling966 and 1 others like this. Anyone who has done the cowl assembly knows what a job it is, I think I counted 144 spot welds that I cut to remove the old one. 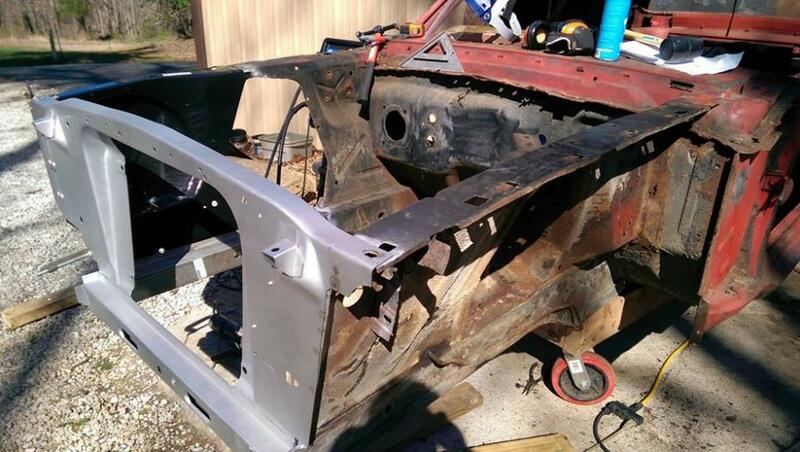 In the first picture, I have the new firewall welded in, the new cowl attached with a couple clamps and a bunch of sheet metal screws. 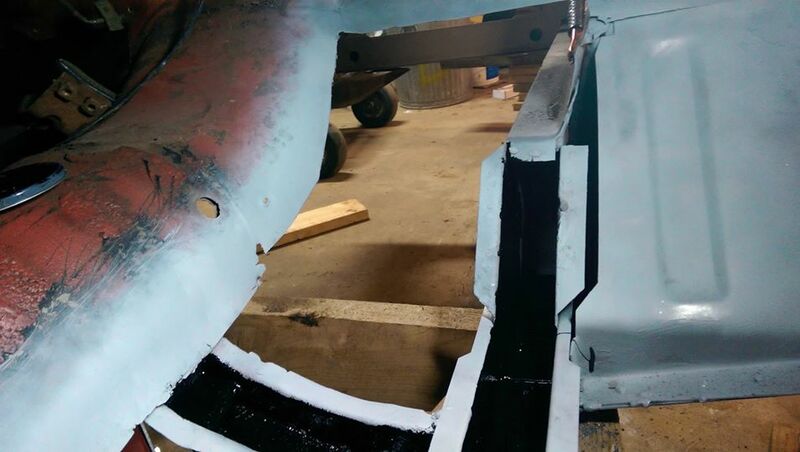 I was so nervous about it, I set the fenders in place to make sure the cowl was positioned right and everything would line back up once I got it in place. Holy moly! I thought I had it bad. Can’t wait to follow the progress on this one. Will be following your progress. Keep at it. Here are a couple more pictures of the firewall install. 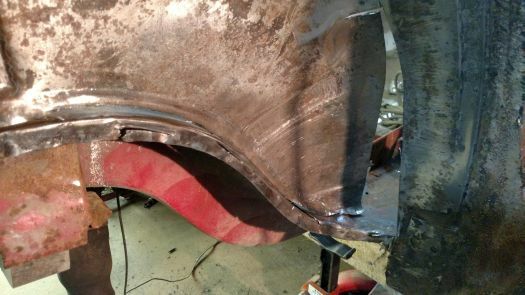 The new firewall wouldn't slide under the floorpan and transmission hump so I ended up having to make slits in the hump on the floor pan and pry it out. Then I had to make slits on the hump section of the new firewall and hammer them in to allow everything to slide together. 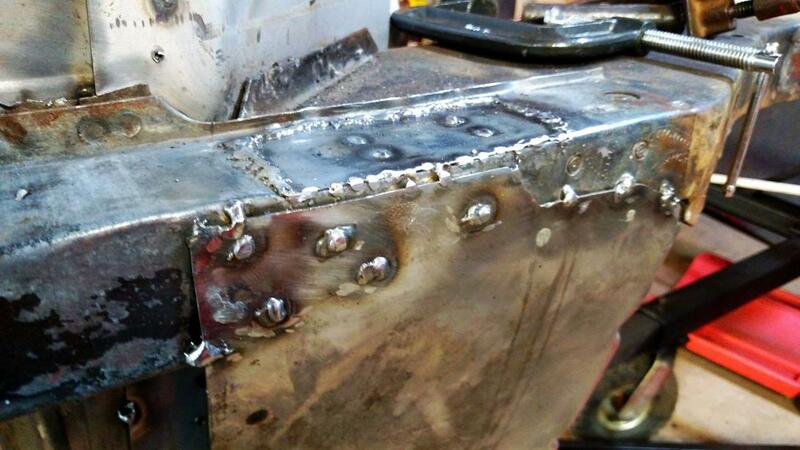 Then of course once I got it slid back in, hammer everything back into place and weld up the cuts I had made. 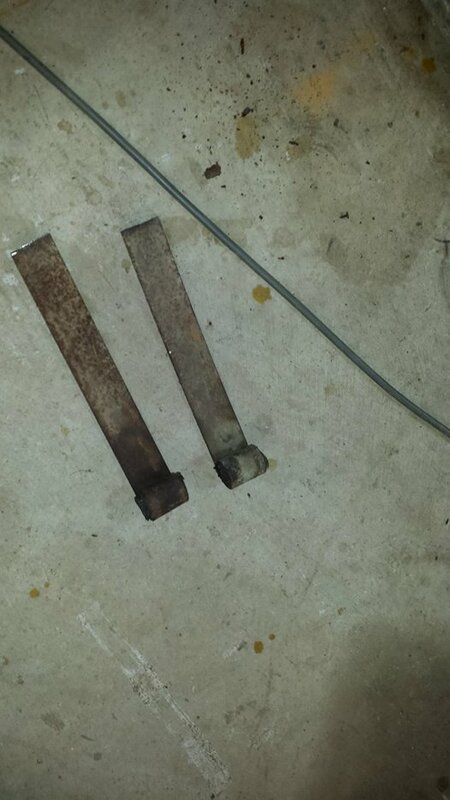 Also had to take the metal brake and make some end pieces for the firewall. It was just a little short of meeting on each end. Along the way, I also installed the torque boxes, which required some application of a BIG hammer and some stitch welding. 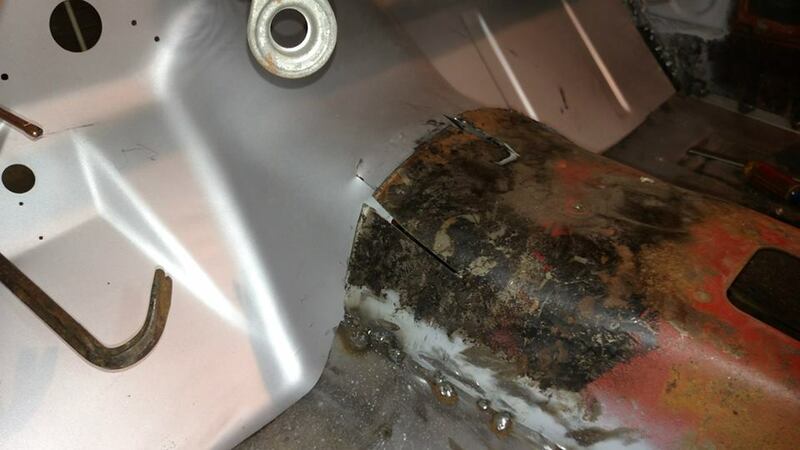 During torque box work I also found a rusted area in drivers floor support and had to make a patch for it. 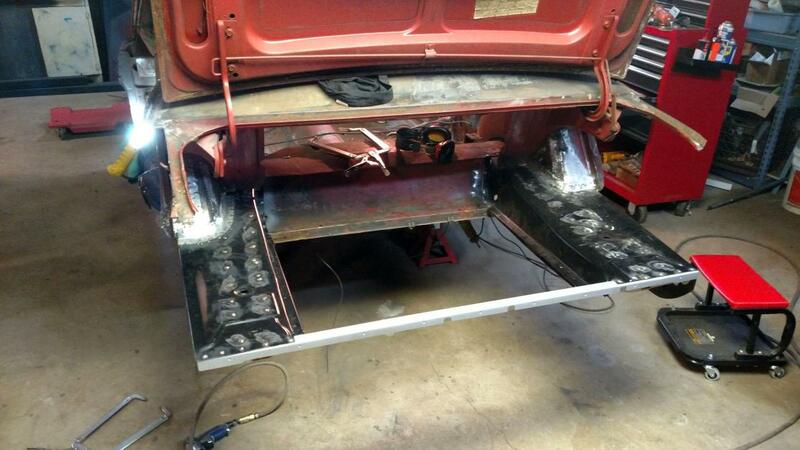 I moved towards the back of the car and started working on the rear wheel wells. The outer wheel housings required replacement, and since I wanted the option to run wider tires, the inner wheel housings required modification. At the time, the only mini-tub kits available caused interference with the interior pieces, particulary the fold down rear seat. So...I decided to modify mine. 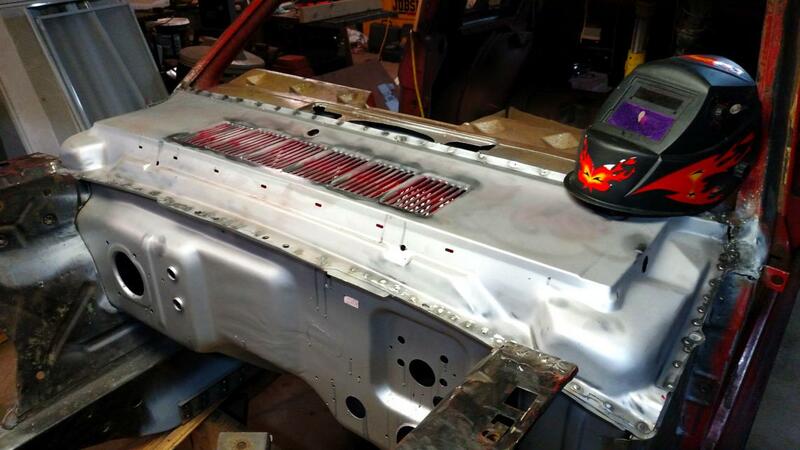 I started with the rear of the housing and the trunk floor. 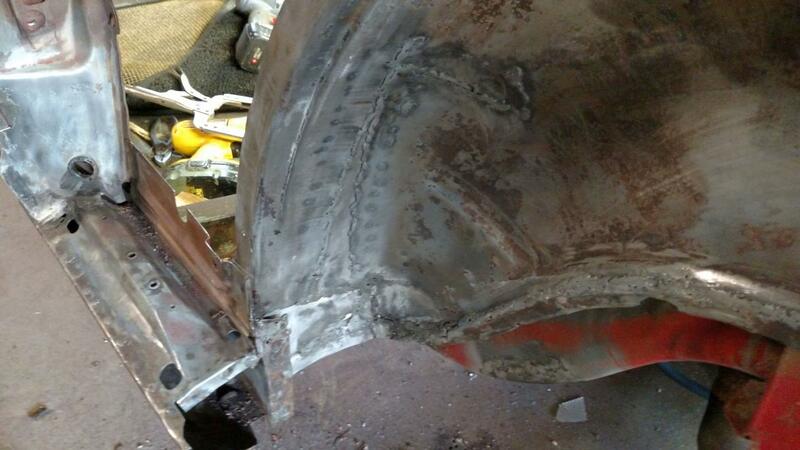 I cut trimmed the trunk floor edge where it met the wheel house and then fabbed a new edge to weld on. I then cut slits in the housing and opened them up to meet the new edges. 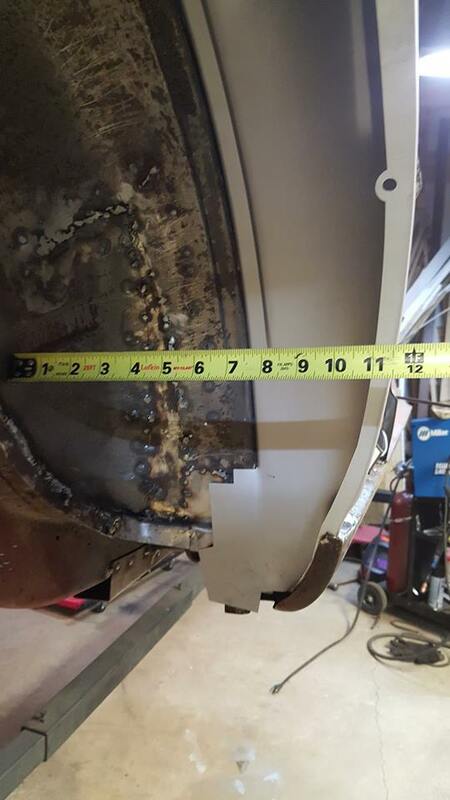 The front of the wheel wells is where you really need room so I tackled them. 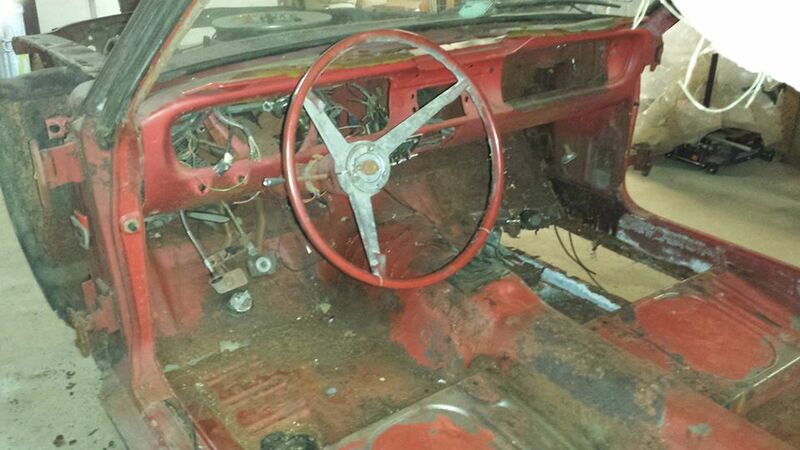 I measured over to where the mounting brackets were to hold the interior trim on and used that as my maximum. 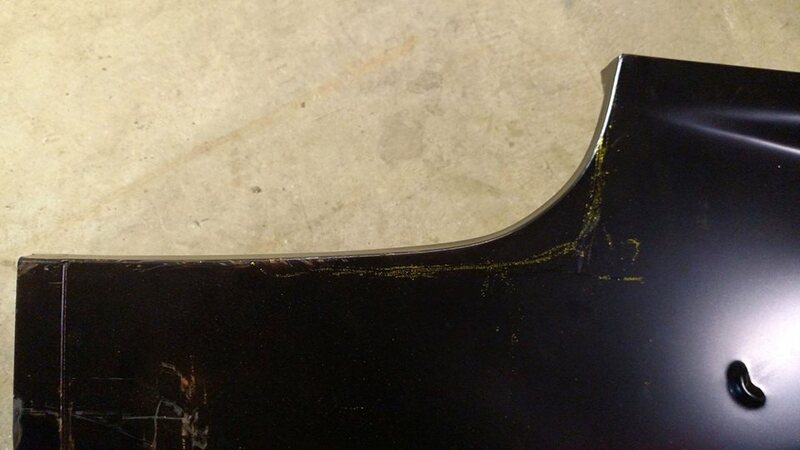 I then cut a large slit up the front of the fender well that I could open up. The pictures don't show it, but I also cut a horizontal one at the top of these slits to allow it to fully expand at the tightest point. 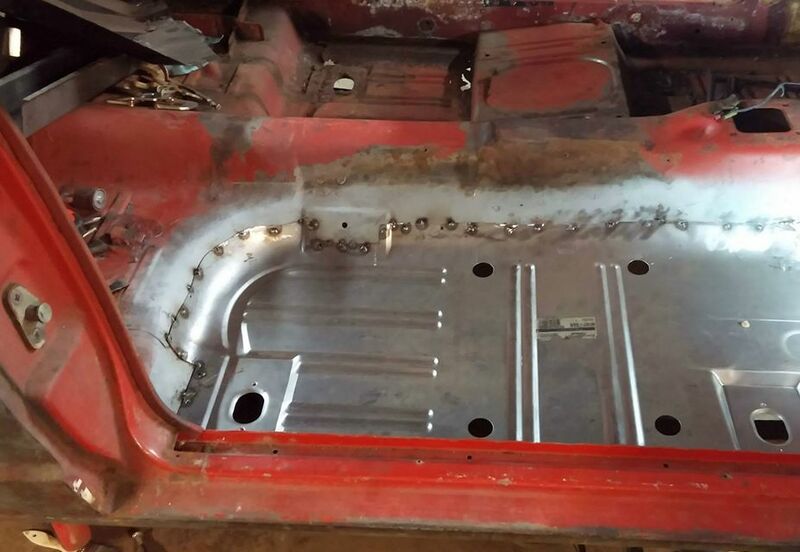 I cut the floor out and again made a new edge and welded it on. After getting it all tacked together, it was obvious that I had picked up some nice tire clearance. 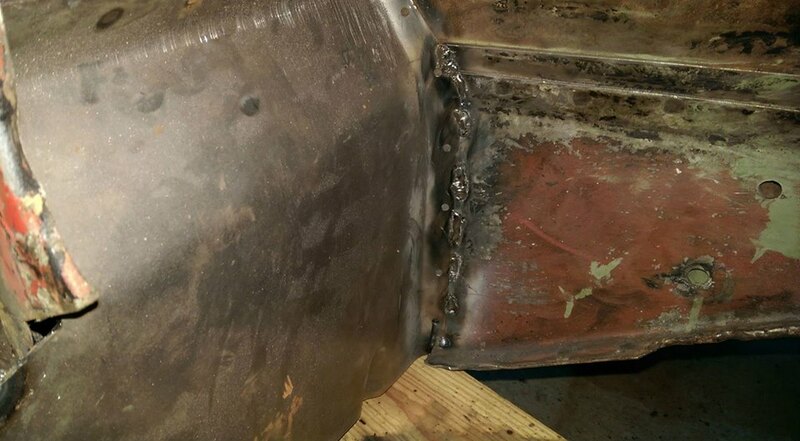 Just had to finish welding and grinding down. Man! I can't wait until your next update. 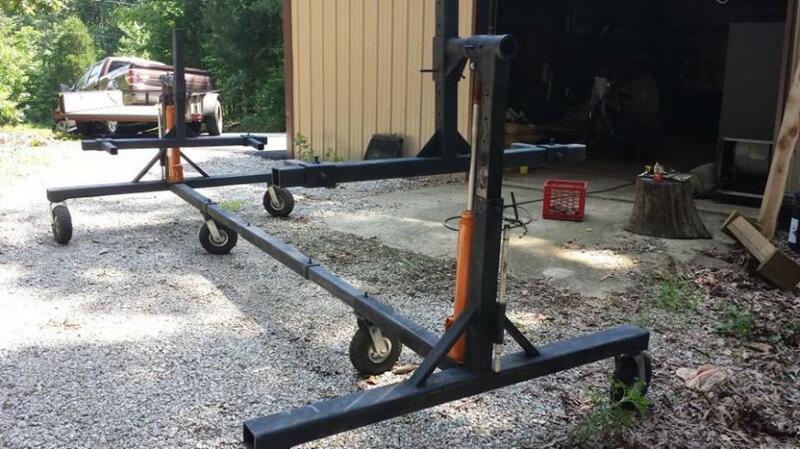 Along the way, I found a heavy duty rotisserie on Craigs List. 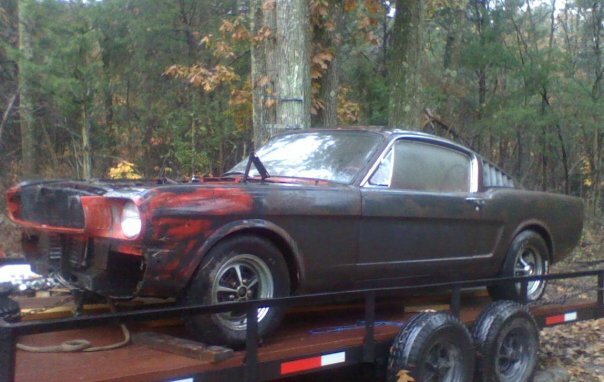 Guy had bought it to restore a Mustang and his health to a downturn so it had never been used. It had the pneumatic tires on it which made it a lot easier to roll outside on the gravel. 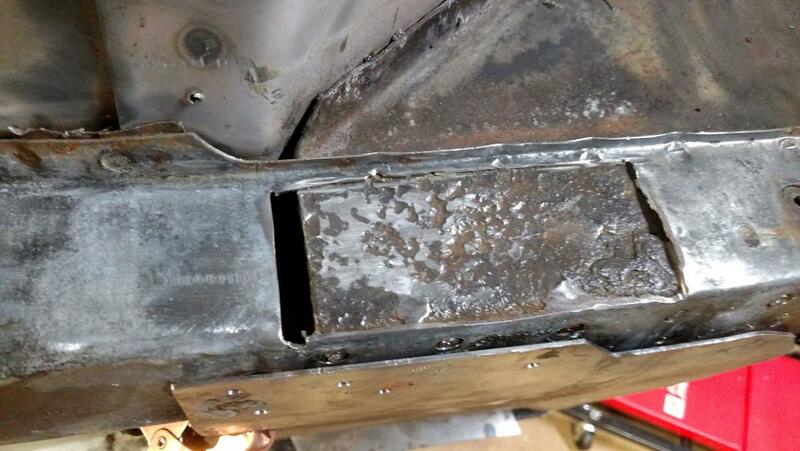 I fabbed up front mounts to bolt into the bumper brackets. For the rear brackets, I used the eye ends off the original leaf strings and bolted them into their original locations. It stayed on that rotisserie for 4 or 5 years. Used it to roll outside for sandblasting. 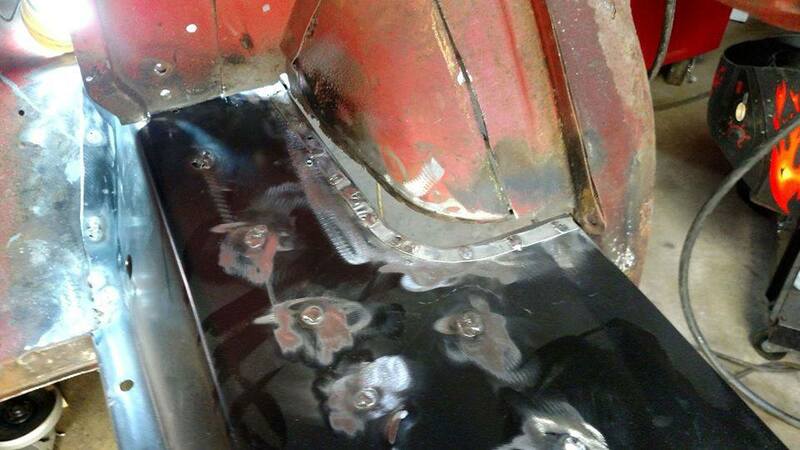 I know a lot of guys cringe at sandblasting due to the danger of warping metal. The only exterior metal left on mine at the time though was the roof and I took it very slow and never left the blast of sand in one place for more than a second. I guess the difference between your own work and a production shop.